Today's the first day of my very first beer advent calendar. This beer is The Big Smoke Smoked Porter by 8 Wired Brewing Co out of Blenhiem, Malborough, New Zealand, making this only the second Kiwi beer I've ever tried! I'm an aficionado of smoked beers, as I believe there's no distinct flavour that a beer must follow by. My idea of the perfect smoked beer is an applewood smoked bacon maple ale.. how yummy would that be?! Get on that Cannery! Appearance: Lots of foaming taking place, so I need this to settle a bit. It diminishes gradually to a light brown cookie-dough like appearance, bit creamy, nice variety of bubble sizes in the foam. The porter is a nice thick dark brown, a slightly cola hue. Aroma: Reminiscent of Rogue Ales' Chipotle Ale, spicy, stings the nostrils, might be a bit too spicy for some, but for me... BRING IT ON! Smokiness is the overall aroma with a SMIDGE of roasted beans and maaaaaybe a hint of dark chocolate? 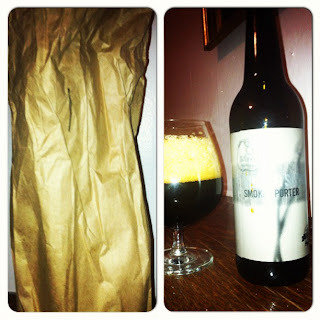 Taste: In all honestly, reminds me of your every day porter, it has that roasted maltiness that leaves a bit of a bitter coffee and chocolate like taste on your palate, followed by a bit of the smokiness that we came to expect from this beer. It's not even near as spicy/hot as I would have expected (thank goodness), instead it's more of a bitterness with a bit of smoke to it. In ways, it reminds me of A SMIDGE of Brugghus Lava Smoked Imperial Stout, which ranks as one of THE best stouts I've ever drank in my life - and unfortunately is no longer available in Manitoba. Overall Thoughts: Taste wise, it has a smidge of a smokiness to it, while the aroma really takes the cake for smokiness, it really stings the senses, so thankfully it's quite smooth to drink, in fact.. I'm almost done half the glass already! Thanks Stephen for this beer! 6.2% ABV, 500mL - for the ABV, it's quite flavourful as I'd expect this to be an 8% porter. Day 1/24 - Blurry but you get it! Now what is this? A smoked beer? It really isn't as crazy as it sounds. 250 years ago virtually all beers were smoked (it's true, Google it! ), but with the dawning of the industrial revolution most of the smoke lifted. However, in the German town of Bamberg the flame has quite literally been kept alive and to this day the town's brewers produce world renowned beers brewed with their own special rauchmalz (beechwood smoked malt). We've taken our best porter recipe and added a good measure of that same Bamberg Rauchmalz. 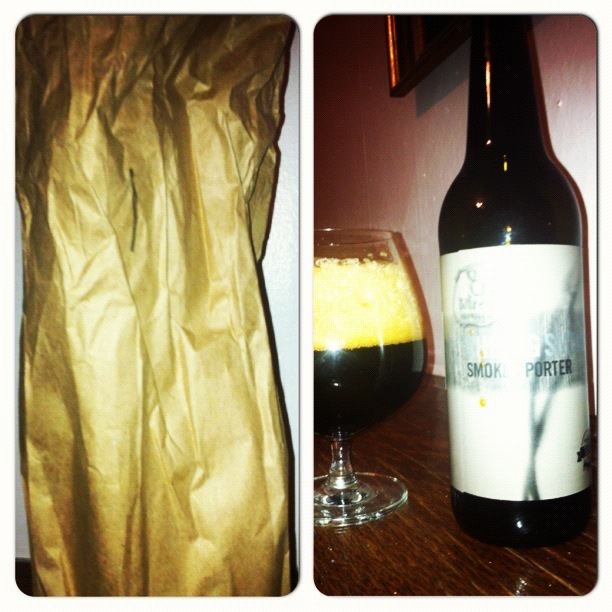 The smoke mingles beautifully with the rich, dark roasted chocolate flavours of the porter without being overpowering. Although it paris extremely well with smoked seafood, barbeques, strong cheeses and hearty stews, its food friendliness isn't limited to savouries; chocolate and caramel based deserts are great companions too! Trust us, it really isn't as crazy as it sounds! This is completely new and interesting gift for you which you have given by your love. Enjoy it.